Business executives and managers at business-to-business (B2B) enterprises care about time, money, competitive advantage, customer loyalty and growth. Few pay much attention to the vital IT infrastructure that supports transactions and collaboration with trading partners—though that B2B backbone directly affects performance and profitability. In fact, just 26 percent of business managers view B2B integration as a competitive differentiator, according to a study for IBM by Vanson Bourne, a research consultancy. As a result, many enterprises continue to utilize manual and error-prone emails, faxes and file transfers for B2B transactions. Reliance on complex, brittle and antiquated systems to exchange critical data impacts time to market, cost-efficiency and satisfaction across suppliers and end-customers. 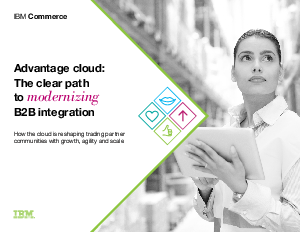 Modernization of B2B integration in recent years has moved forward in fits and starts, often undermined by competing priorities and misalignment between business and IT managers.